Nomenclature: what a headache. We’ve got all these accumulated years of jargon regarding chemical structures, and unless you learn the lingo, it can be confusing to follow what’s going on. Case in point: butyl. There are FOUR different types of “butyls”, and they all have their own name. In addition they each have a common name (“trivial name”) which they commonly go by. It’s easy to get confused. So today’s post is a guide to sorting them out. 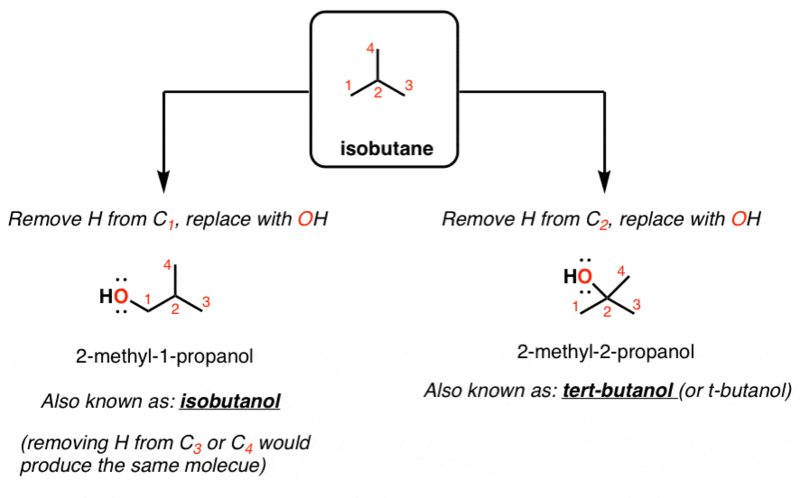 Butane has four carbons. Now there’s two potential ways to organize those carbons – the 4-carbon straight chain (n-butane), and the 3-carbon chain with a methyl group on carbon #2 (2-methyl propane, also known as “isobutane”). Don’t believe me? Try it out for yourself. There’s only two ways to do it. Now let’s say we have some substituent. For example, let’s make it OH. Let’s remove a hydrogen from butane and replace it with OH. If you look at n-butane, you’ll see there’s really only two ways to do it. You can take it from C-1 (or C-4), in which case you get a primary alcohol (1-butanol, or “n-butanol”). Or you can take it from C-2 (or C-3) in which case you get a secondary alcohol (2-butanol, or “sec-butanol”). We sometimes shorten that to “s-butanol”. Likewise for the isobutyl skeleton there is two ways to do it. You can replace an H on C-1 (or C-3 or C-4) with OH, in which case you get 2-methyl-1-propanol (“isobutanol”). Or you can replace an H on C-2 with OH, and get 2-methyl-2-propanol (“t-butanol”). Those are the only two ways to do it! This applies to other groups too. So if we used Cl instead of OH, we’d have n-butyl chloride, s-butyl chloride, t-butyl chloride, and isobutyl chloride. And if we used some other group, those four names – n-butyl, s-butyl, t-butyl or isobutyl – all remain the same. So here’s the punch line for butyl. What about pentyl? Thankfully, there’s too many possibilities to be limited to this simple system. There’s only one weird case: 2,2-dimethylpropane. We call this “neopentane”. If you replace an H with a substituent, that becomes the “neopentyl” group. thank you very much with your great work, we need more people like you who inspire students to try and do best….can i please get soft copy of your organic 2 notes. I have a quesion! Are isobutyl alcohal and t butyl alcohal postition isomers or chain isomers? Constitutional isomers. The terms “positional” and “chain” isomers are not familiar to me, but if I interpret their use correctly they are position isomers. Actually they aren’t isomers because they don’t have the same molecular formula. Iso butyl alc.has formula c4h9o while the latter has c4h10o. take a look at the 3D structure of both molecules (making sure that the structures show the Hydrogens), and count the hydrogens… you will end up with ten hydrogens total, including the hydrogen from the OH group. Really helpful, thanks! I was trying to purely memorize which name went with which butyl, and I figured there had to be a logical explanation behind the name. You explained it really well. Very helpful. Read the section in my text several times, couldn’t figure out the difference between secondary and iso forms. Read your explanation once. Got it. Great, glad you found it helpful! At the end where you go from Neopentane to Neopentyl Alcohol would the formula change to 2,2-dimethylpropanol because you added the OH? Keep Up the Excellent Work! Its great to see individuals, such as yourself, helping students in need. Can this apply to different carbon chains that are greater than butane? For example is it possible to have a tert-hexanol or isoheptane? Hi – no, it only applies to butane. There are so many isomers possible for chains higher than 4 that the prefixes “tert”, “iso” and so on would not refer to unique isomers. sec, tert, only apply to butane. iso applies to butyl and propyl. 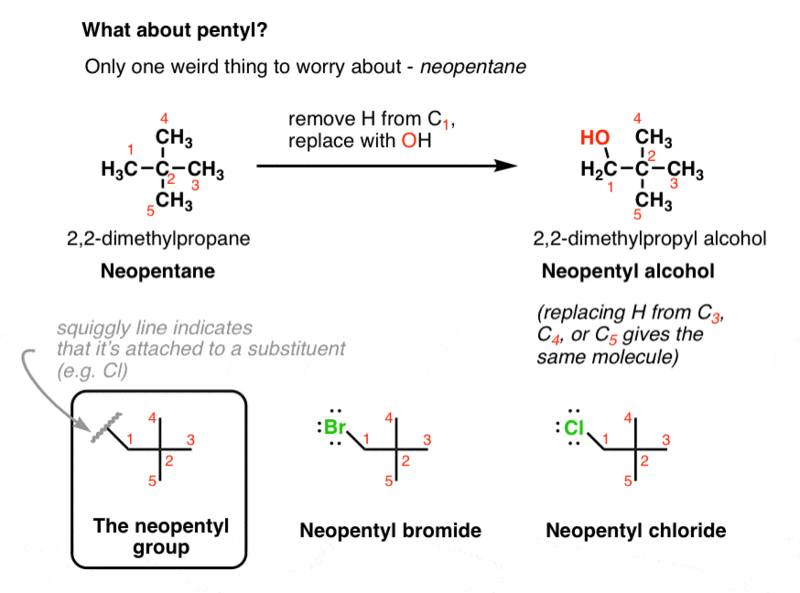 neo only applies to pentane. Best find ever! Love the whole website. They’re not wrong names – they’re just common names AND they are widely used so it is completely appropriate to discuss them. They are “common wrong names”. As I wrote, they should be commented (and encourage people not to use them). I’ve got my nomenclature test tomorrow, I learn more from here than my classes. Chain isomerism is change in skeleton. Whereas position isomerism is change in position of substituents. Hope my effort would clear or doubt. Understanding Lewis diagrams is, possibly, the most basic skill you need for organic chemistry. Almost every resource available about o-chem depends on Lewis diagrams to explain structure and behavior. I’m going to assume that you struggled with your exam, but best luck on learning diagrams for the next test. What’s the difference between isobutane and secondary butane?? 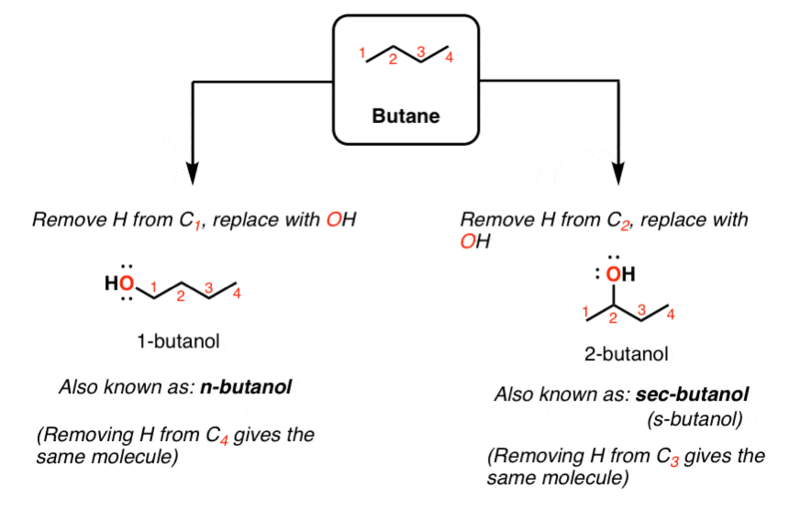 There is no “secondary butane” but there is “sec-butyl” which is when we take a hydrogen off of C2 of butane and stick it on something. Isobutane is the molecule formally called “2-methylpropane” . If we take a hydrogen from one of the methyl groups of isobutane and stick it on something, it is often called, “isobutyl” . For example, isobutyl chloride. What about stereo-isomers? For instance, are there not 2 forms of 2-butanol? There are, but that subject has generally not come up by the time people learn about isomers of alkanes. can we name text butyl (1,1-dimethylethyl)? in alphabetical order the prefix iso- and neo- are considerd to be the part of fundamental ne of alkyle group but prefix sec- and tert- are not considered to be part of the fundamental name. why so ??? Don’t ask me, ask IUPAC. Why is isobutyl bromide not a secondary Alkyl halide? The carbon attached to the bromine is itself only attached to one carbon. Oh my god! Im so glad i stumbles across this website. This helps me a lot in understanding the butyl. The punch line is great. i have test tomorrow and now i can finally understand how to differentiate iso, t, and sec butyl + gains new knowledge, the neopentane! Lovely! i would like to know does tetra butyl titanium differ with tetra-n-butyl titanium??? 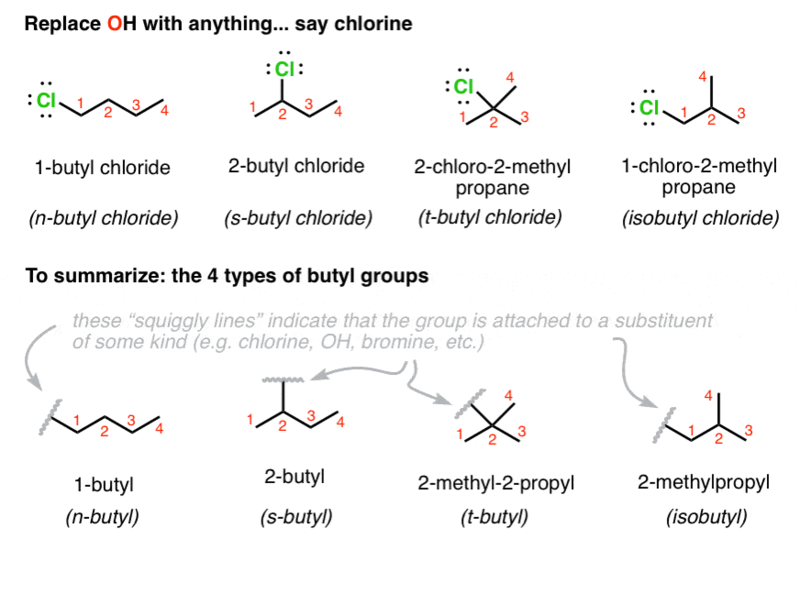 Assume that “butyl” refers to n-butyl unless told otherwise. What is the difference between sec butyl and iso butyl ?plz help me sir … m very confused between the two …. both of them are butyl but what is it that causes one to be called sec and other as iso? It’s in the article. I don’t know how to make it any simpler.